Measure 20 inches of the medium chain and open the link carefully to remove the excess. If the lobster claw will fit on the link attach it directly before closing the link. If not use a jump ring to attach the clasp to one end of the chain. Attach one end of the fine chain to the same link the lobster claw is attached to. Measure 4 inches along the medium chain and 6.25 inches along the fine chain and attach the two together with a jump ring. Repeat 3 more times so you have the medium chain with 4 loops of fine chain. Attach the end of the fine chain to a point 2 inches from the end of the medium chain that has the lobster claw clasp (this should be the center of the first loop you made). Measure 4 inches along the medium chain and 6.25 inches along the fine chain and attach the two together with a jump ring (this should be the middle of the second loop). Make a longer loop for the second loop of the second pass (mine is 7.25 inches for 4 inches across the medium chain) to frame your center accent piece. The 3rd loop of the second pass should be the same size as the first one (so 6.25 inches of fine chain for 4 inches of medium chain.) If you purchased the above specified chain, you will be short for the last loop and need to attach another length of chain. Just pry open one line slip the second length of fine chain to the end and close the link. OPTIONAL - leave 6.25 inches of fine chain dangle and add a lobster claw clasp to the end. 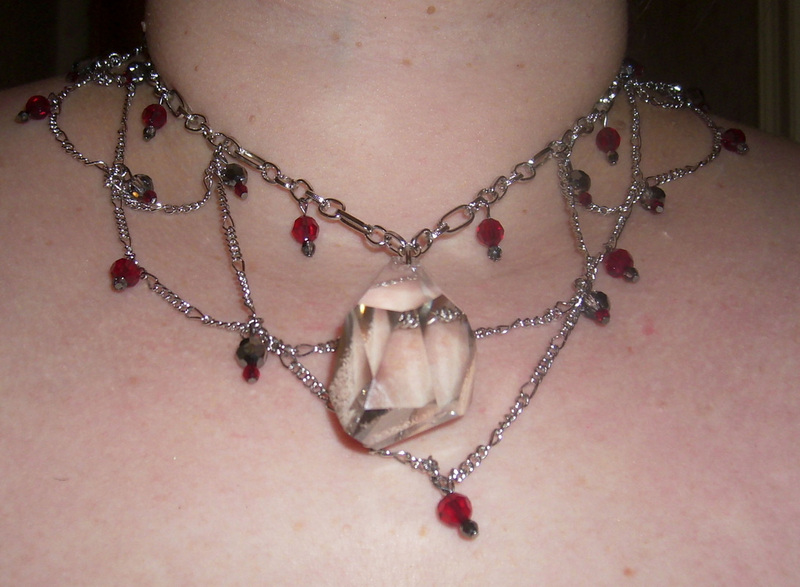 This will allow you to create a loop across the back of the necklace when it is on. You can use 6mm and 3mm round faceted Swarovski Crystals in Siam and Silver Night to decorate the necklace. Place the beads on head pins in the pattern that you like. Create a loop (there is a video below demonstrating how to create a loop) and hook it over a link of chain where you want it positioned and use chain nosed pliers to close the loop. Here is a video that shows two techniques for making a loop (the first two).